Signs that a byelection is around the corner were aplenty on the Semiahmoo Peninsula Wednesday, as leaders of two major political parties made appearances in White Rock and South Surrey. First, in the afternoon, Prime Minister Justin Trudeau toured White Rock’s Five Corners District with Liberal candidate Gordon Hogg; then, Conservative Leader Andrew Scheer addressed supporters at an evening rally organized at the Pacific Inn and Convention Centre to launch the campaign of candidate Kerry-Lynne Findlay. The presence of both political leaders made an impression. “Wow. Trudeau in town today and just had Andrew Scheer knocking at our door,” Pauline Wilcock posted on Peace Arch News’ Facebook page Wednesday afternoon, just hours after Trudeau’s tour, and shortly before Scheer arrived at the rally. 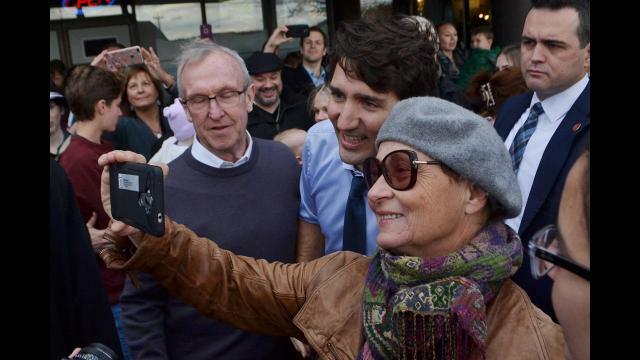 The prime minister arrived at Laura’s Coffee Corner around 2:15 p.m., shaking hands, giving high-fives and posing for selfies as he made his way to the coffee shop. About 15 minutes later, he walked through a crowd to Five Corners Café, greeting many people along the way. 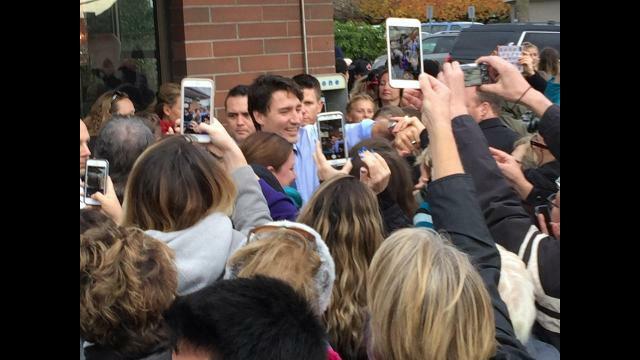 More than 1,000 people, young and old, turned out for Trudeau’s arrival – which Hogg described as “a great tribute to Laura (Cornale, of Laura’s Coffee Corner)” and drew “way more people than I anticipated” – with some waiting more than two hours to meet the prime minister. A few people waiting were carrying placards, and many were poised with their cellphones at-the-ready for any photo-ops. Several people used Trudeau’s arrival as a platform for activism, including White Rock residents Eve Weimer and Pat Kealy. They said that former prime minister Pierre Trudeau, Justin’s late father, made a commitment in 1972 that he would have the railway, which passes along White Rock’s waterfront, relocated. The women were among the first residents to camp in front of Laura’s coffee shop, and had a chance to speak to the prime minister as he walked to Five Corners Café, located across the street from Laura’s original location, which was destroyed in the May 2016 Five Corners fire. Kealy and Weimer both asked Trudeau if he knew of his father’s note about relocating the waterfront railway. Trudeau’s visit followed a morning engagement at the United Nations Peacekeeping Conference in Vancouver. Although he held a question-and-answer period at the UN event, a member of Trudeau’s entourage advised PAN he would not be taking questions from local media at the White Rock event. Between 250 and 300 people registered for the Scheer event at Pacific Inn, according to a member of the Conservatives’ on-site team. Attendees filled chairs of a ballroom that was decked out with blue balloons, campaign signs and banners. Prior to Scheer’s arrival, longtime White Rock physician Glen Anderson told PAN he joined the Conservative party because he was “so angry” by tax changes that he said will take away the opportunity for him to assist with his grandchildren’s education. Opponents of marijuana legalization took the opportunity to deliver a 9,000-signature petition to Scheer. Pamela McColl told PAN the move was a “friendly” one that she and others behind the drive hope will have an impact. A private visit with Scheer was also secured, McColl said. The Tory leader was in North Surrey prior to the South Surrey rally, for a “roundtable dialogue” at the Surrey Board of Trade office in Whalley, on issues including local politics. “It’s always a battle, it was a tight race in the last election and we know that every election is tough,” Scheer said. “We don’t take any byelection, any election, anywhere, for granted, so I’m here today to support our candidate Kerry-Lynne Findlay. I know she’s working hard – she had a great record in the previous government, acquitted herself excellently in a meaningful cabinet post. Before addressing supporters at Pacific Inn, Scheer and Findlay took some time to knock on area doors. The Conservatives selected Findlay, former minister of national revenue, as their candidate on Monday. The Liberal Party of Canada officially announced Hogg as its candidate on Nov. 5, the same day the byelection was announced. Wednesday, the Progressive Canadian Party announced Michael Huenefeld as their candidate. The South Surrey-White Rock seat was left vacant when former Surrey mayor Dianne Watts resigned as Conservative MP, a post she’d held for two years, to run for leadership of the BC Liberals. The byelection is set for Dec. 11. (ABOVE SLIDESHOW, Peace Arch News reached out to readers asking for their photographs on the prime minister’s walking tour, and were overwhelmed by the response.